Preheat the oven to 100°C. Grease two baking sheets with nonstick spray, line with baking paper, grease and sift cornflour over. 1. Meringues Put the egg whites, sugar and tartaric acid in a glass bowl, then put the bowl on top of a saucepan with boiling water and simmer for 3 minutes or until warm and the sugar has dissolved. Remove from the heat and beat until light and shiny – about 10 minutes. Sift the cornflour over, add the rosewater, rosemary or lavender and fold into the egg mixture. 2. Spoon heaped tablespoonfuls (at least 20) of the egg-white mixture onto the prepared baking sheets and sprinkle the nuts over. Bake for 2 hours or until cooked on the outside. Switch the oven off and leave to cool in the oven overnight. Store in an airtight container. 3. Fruit Pour the water over the leaves and allow to cool. Remove the leaves and add the sugar and rosewater syrup to the water. Boil for 5 minutes. Pour the syrup over the fruit and allow to cool. 4. 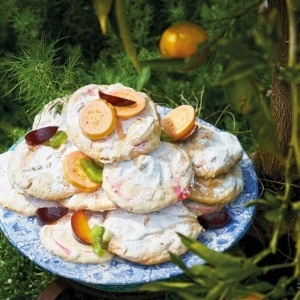 To serve: Put the meringues in a wide bowl and spoon the fruit over. Serve with whipped cream (if using).